Time for CorporateCorp’s Office Talent Show and Mandatory Quarterly Meeting! As in years past, our “Q2 Revue” will feature all of your favorite Department Leads and Committee Chairs showing us their “off-the-clock” talents while providing us all with crucial information regarding our recent software updates, amended Sexual Harassment Policy, new Emergency Response protocol, and much more! Your hostesses for the evening will be our lovely “Compulsory Fun Coordinators”, Mindi Mimosa and Callie Pigeon! This quarter’s confirmed presenters will be Karen from Human Resources, Karen from IT, and Karen from the Mailroom, with a special return visit from our favorite team-building improv troupe, Jive Turkey and Friends! We will also have a 15-minute go-go dancing set from our temp Kenneth. Tipping is encouraged, as all proceeds will go toward his baby shower. The meeting will wrap, as always, with a reading of the Quarterly Report by our CEO, Karen. Is your office cube feeling smaller every day? Will one more unnecessary "reply all" send you over the edge? This is the show for you. 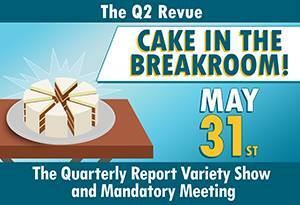 Cake in the Breakroom is the a corporate office-themed variety show for all you malcontent cogs in the greasy wheels of capitalism. If nothing else, the cake is free.